WASHINGTON (CNN) -- In Washington and throughout the nation's legal system, speculation took off Friday over who may join the Supreme Court after the retirement of Justice David Souter. 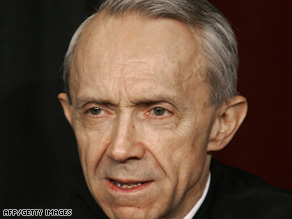 Word that Supreme Court Justice David Souter is expected to retire came as something of a surprise. Souter plans to retire after the current term recesses in June, he said Friday in a letter to the White House, bringing to an end his more than 18 years on the bench. The vacancy would give President Obama his first Supreme Court appointment -- the first since President George W. Bush's picks of Samuel Alito in 2006 and Chief Justice John Roberts in 2005. "The balance on the court will probably not shift a great deal," said Jeffrey Toobin, CNN senior legal analyst. Though Souter was tapped by President George H.W. Bush in 1990, he became "part of the liberal wing," Toobin said. "Obama will appoint someone who will vote much the same way. But new people always change the court. And a new liberal justice, perhaps a woman, perhaps an African-American, perhaps the first Hispanic on the court, really could change the court in subtle but real ways." iReport.com: What qualities would you like to see in the next appointee? • Judge Sonia Sotomayor of the 2nd Circuit U.S. Court of Appeals. Named a district court judge by President George H.W. Bush in 1992, she has been on the appeals bench since 1998. She'd likely have some bipartisan support. The 54-year-old is considered to have moderate-liberal views, and would be the first Hispanic justice on the high court. • Solicitor General Elena Kagan. She served in the Clinton White House in various legal and public policy positions. Kagan, 49, once clerked at the court, but has no judicial experience. When she served as dean of Harvard Law School, she was praised for naming several conservatives to the faculty. • Judge Diane Wood of the 7th Circuit U.S. Court of Appeals. On the bench sine 1995, the 58-year-old is considered a moderate liberal. A former clerk at the court, she served in both the Reagan and Clinton Justice departments. • Massachusetts Gov. Deval Patrick. A former assistant U.S. attorney general for civil rights under Clinton, the 52-year-old Patrick -- an early supporter of Obama's presidential candidacy -- once worked for the NAACP. • Judge Ann Claire Williams of the 7th Circuit U.S. Court of Appeals. Nominated to district court by President Reagan in 1985, she was elevated to her current job by President Clinton. Considered a moderate, the 59-year-old is the third African-American female appeals court judge -- and would be the first African-American woman on the high court. • Michigan Gov. Jennifer Granholm. A popular leader in her state, former state attorney general, and early supporter of Obama's presidency, she -- like Obama -- attended Harvard Law School. She is 50 years old. Sources point to numerous other possible nominees as well, including federal appeals court Judges Merrick Garland, Marjorie Rendell, Jose Cabranes, and M. Margaret McKeown. Souter's departure will leave the two oldest justices -- and the most liberal -- still on the bench. Retirements for John Paul Stevens, 89, and Ruth Bader Ginsburg, 76, have been rumored for years, with many expecting that one or the other would be the first to give a new Democratic president a Supreme Court vacancy. Souter's decision came as something of a surprise, although he has long been known to prefer the quiet of his New Hampshire farmhouse to the bustle of the nation's capital.